A café racer, is a type of motorcycle as well as a type of motorcyclist. Both meanings have their roots in the 1960s British counterculture group the Rockers or the Ton Up Club, although they were also common in Italy, Germany, and other European countries. Rockers were a young and rebellious Rock and Roll counterculture that wanted a fast, personalized and distinctive bike to travel between transport cafés along the newly built arterial motorways in and around British towns and cities. The goal of many was to be able to reach 100 miles per hour (called simply “the ton”) along such a route where the rider would leave from a cafe, race to a predetermined point and back to the cafe before a single song could play on the jukebox, called record-racing. They are remembered as being especially fond of Rockabilly music and their image is now embedded in today’s rockabilly culture. A classic example of this was to race from the Ace Cafe on The North Circular road in NW London to the Hanger Lane junction as it then was – it is now the more famous Hanger Lane Gyratory System – and back again. The aim was to get back to the Ace Cafe before the record you’d put onto the jukebox had finished. Given that some of the Eddie Cochran tunes that were in vogue at this time were less than 2 minutes long, the racers would have had to traverse the three miles round trip at extremely high speed. The cafe racer is a motorcycle that has been modified for speed and good handling rather than comfort. Cafe racers’ bodywork and control layout typically mimicked the style of contemporary Grand Prix roadracers, featuring an elongated fuel tank and small, rearward mounted, humped seat. A signature trait were low, narrow handlebars that provided more precise control at high speeds and allowed the rider to “tuck in” to lessen wind resistance. These are referred to as either “clip-ons” (two-piece bars that bolt directly to each fork tube) or “clubmans” (one piece bars that attach to the stock mounting location but drop down and forward). The ergonomics resulting from low bars and the rearward seat often required “rearsets,” or rear-set footrests and foot controls, again typical of racing motorcycles of the era. Distinctive half or full race-style fairings were sometimes mounted to the forks or frame. The bikes had a raw, utilitarian and stripped-down appearance while the engines were tuned for maximum speed. These motorcycles were lean, light and handled road surfaces well. The most defining machine of its heyday was the homemade Norton Featherbed framed and Triumph Bonneville engined machine called “The Triton”. It used the most common and fastest racing engine combined with the best handling frame of its day, the Featherbed frame by Norton Motorcycles. Those with less money could opt for a “Tribsa” – the Triumph engine in a BSA frame. The cafe racer has a lot in common with the chopper or bobber scene in the USA and both have their roots with post-World War II veterans. Riders rejected the large transportation-oriented motorcycles of the time by taking these motorcycles and removing parts deemed unnecessary. While American GIs would take military-spec Harley Davidson’s and “chop” off anything unnecessary to improve performance, European veterans took similar measures with their motorcycles. Both looked to make the standard factory motorcycles faster and lighter, although the difference between the nature of the US and European road systems led to somewhat different results. While the Americans favored a low heavy cruiser style of motorcycle for straight line comfort, the Europeans preferred a higher, more nimble motorcycle better suited to the more twisting roads of their nations. In Britain, many roads can be traced to Roman origin and even older roads following terrain. There were no interstates/autobahn type roads until late 1950s. ‘A’ roads were(are) better surfaced and wider with multiple travel lanes in built-up areas or between urban areas but may be only two lane undivided highway in low traffic areas (such as the M1 motorway). It must be remembered that it was also a style born largely out of the poverty of Post-War Europe and so not given to the excesses of later Harley-Davidson billet barge style customization. Cafe racer styling evolved throughout the time of their popularity. By the mid-70’s, Japanese bikes had overtaken British bikes in the marketplace, and the look of real Grand Prix racing bikes had changed. The hand-made, frequently unpainted aluminum racing petrol tanks of the 1960s had evolved into square, narrow, fiberglass tanks. More and more, three- and four-cylinder Hondas and Kawasakis were the basis for cafe racer conversions. By 1977, a number of manufacturers had taken notice of the cafe racer boom and were producing factory cafe racers, most notably the Harley-Davidson XLCR, the Ducati Super Sport models and the Kawasaki Z1R. In 1979, Suzuki offered the cafe-style GS1000S. While the first cafe racer conversions amounted to a nearly complete re-engineering of the motorcycle, by the mid-70s riders began modifying standard production motorcycles into so-called “cafe racers” by simply equipping them with clubman bars and a small “bubble” quarter fairing around the headlight. A number of European manufacturers, including Aspes, Benelli, BMW, Bultaco & Derbi produced factory “cafe” variants of their standard motorcycles in this manner, without any modifications made to make them faster or more powerful. Once cafe racer styling became just that–a styling exercise that served no functional purpose and simply made bike less comfortable to ride–the trend quickly waned in popularity. Soon afterward, most new sport bikes began featuring integral bodywork from the factory, negating the need or ability to retrofit an aftermarket cafe fairing. The term cafe racer is still used to describe motorcycles of a certain style and some motorcyclists still use this term in self-description. Worthy of mentioning here is that an entire new sub-culture has evolved since the heyday of the Rockers. 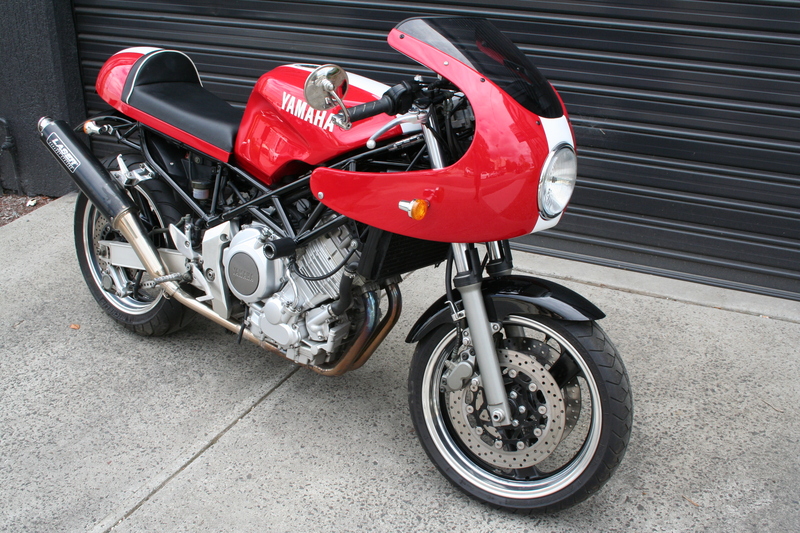 The ‘cafe racers’, a term that existed in the 1950s and 1960s to refer to bike riders of the race track, but is used now to describe motorcycle riders who choose classic/vintage British, German, Italian, or Japanese motorbikes from the 50s-to late 1970s as their bike of choice, over other styles of bikes. These cafe racers do not follow the fashion/music subculture of the Rockers, old or new, but dress in a more modern and comfortable appearance with only a hint of likeness to the Rockers style. Common Levi jeans, generic motorcycle jackets and boots, with modern helmets being the norm, instead of the very specific brand names, styles and look established by the Rockers. These cafe racers have taken elements of the American Greaser, British Rocker and modern motorcycle rider look to create a style all their own. Classic cafe racer style has made a comeback recently, thanks largely to the increased interest in vintage motorcycles in general. The baby boomers were responsible for a surge in motorcycle sales in the late 1960s and ’70s, and many of this generation now find themselves with the time and discretionary income to recreate the bikes they had–or wished to have–in their younger years.